This study of the legendary Berlin literary and cultural journal Sinn und Form (1949- ) has a twofold significance. 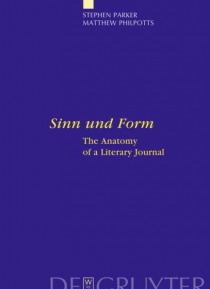 Based on extensive archival research and a detailed reading of the journal's published face, it is a comprehensive history of Sinn und Form"e;, whose founding editor was Peter Huchel and whose authors include Bertolt Brecht, Ernst Bloch, Pablo Neruda, Romain Rolland, Peter Wei… ss, Christa Wolf, Heiner Muller and Durs Grunbein. As such, it offers a fascinating perspective on the cultural history of the GDR and post-unification Germany. The study is also a first typological analysis of the anatomy of such a journal, organised in seven analytical categories: founding conception; cultural-political context; institutional infrastructure; role of editors; network of contributors; textual and compositional dimension; readership and reception. Drawing on Pierre Bourdieu's sociology of culture, the authors set out to explain how the journal acquired and maintained its influence over the last 60 years. In turn, this conceptualisation of the journal as an agent in the cultural field opens the way for systematic research into literary and cultural journals from a comparative perspective, synthesising sociological and literary approaches.